Lily Casket, delivered next day - fresh flowers delivery from Clare Florist. 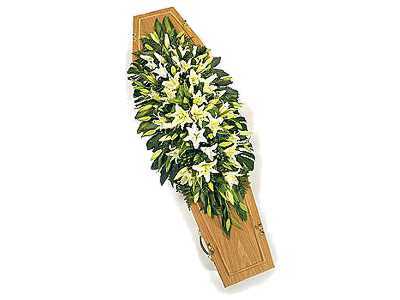 A double ended casket spray of; Oriental Lilies, Green Hypericum, Monstera, Dracaena, Fatsia, Leatherleaf and Scindapsus. Charmingly arranged and presented by in house expert florists and delivered as per your requirements to any address in the UK for £119.95.